The Wise Old Games Owl is a colossus of games development. With over fifty years experience, he knows everything there is to know about games development and the games industry. And it is now time for his voice to be heard, whether you like it or not. Via an authentic 1995 OS interface, piece together just whatever the hell it is that he is trying to say from over 16 minutes of incredible video footage and draw your own conclusions about... something or other. 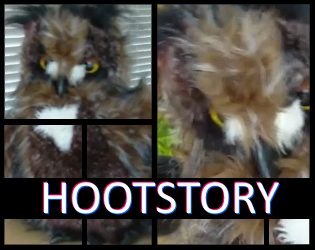 Note: Built as a pesudo-games jam exercise in less than 24 non-consecutive hours, by someone who hasn't played HerStory - HootStory attempts to recreate the excitement and tension of that game, based solely on misremembered information from reading a single review of it. Extract the zip to a folder of your choice then away you go. The game supports Windows only - results may vary when run in a virtualized environment.